This is the opening night of Monday’s Soundclash, a club night chock full of new and familiar indie tracks. And what better way to celebrate than with a selection of the best live local indie acts including The Monday Club (funnily enough) to kick off the week. The room starts to fill up with students as Doncaster lads, The Kavaliers blast out their Oasis-meets-Arctic-Monkeys tunes. One song reminds me of Oasis’s ‘Rock’n’Roll Star’ with its wailing guitar solo and the frontman’s Liam Gallagher attitude vocals, whilst melodic songs such as ‘Living The Dream’ cement them as a typically Yorkshire indie band. Keeping it local, Seven Hills are another all-male, Sheffield band who lean closer to the Arctics side of indie. ‘Bite The Bullet’ has a high, crying, ‘Mardy Bum’ sounding guitar over it, whilst one of the guitarists becomes the vocalist for an adolescent song about fancying girls, which he dedicates “to girls with long blond hair.” The main vocalist returns in the yellow spotlights for a cover of The Libertines, ‘Don’t Look Back Into The Sun’, which is later followed by a humorous and crowd pleasing cover of Human League’s, ‘Don’t You Want Me’ before finishing with the more serious, ‘Assassin In Black’. As Elephants Are provide relief from bouncing indie tunes with their darker, more emotional sounding indie. Looking far more like a skater from California than a lad from Yorkshire, wearing a baseball cap and baggy T-shirt, the vocalist reaches higher notes than the previous acts, which also complement the band’s chilled sound. Twiddly, ethereal guitars are a theme running through every song and make As Elephants Are absorbing to watch. By now, the tiny gig room is full of Rod Stewart haircuts, polo shirts and Pete Doherty look-a-likes. 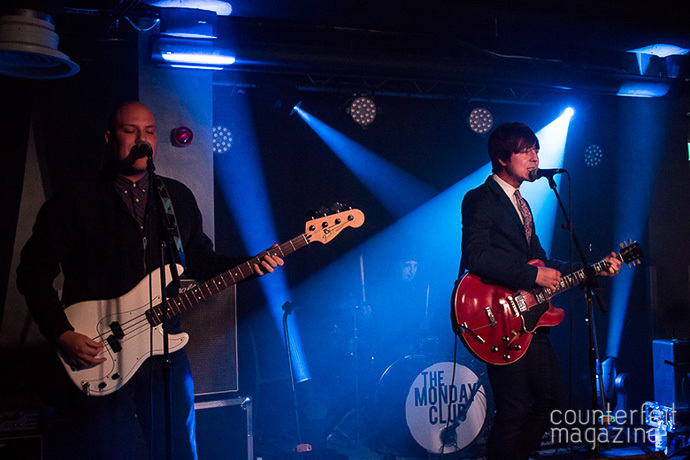 The Monday Club, led by a frontman in a Beatles-inspired, fitted, blue suit arrive. Judging by their tight performance and air of professionalism, its obvious they’ve been around the gigging block a few time. ‘Lately’ is the catchiest, most memorable indie anthem, whilst ‘Someone To You’ has surprising, pop punk undertones. Although, ‘Time Ticks Away’ is one of their singles, it doesn’t have as much impact as their bouncier unreleased tracks. A couple of fresher girls at the front suddenly start dancing to a solid penultimate rock tune, which is followed by many thanks from The Monday Club. They finish with forthcoming single, ‘Itchy Feet’, which oozes Oasis sing-along ability. The bands tonight are certainly not pushing any new genre boundaries, but firm Brit Pop and indie believers will love Soundclash because this night stays faithful to this sound.